In our previous blog we looked at using the B-SMART acronym to help you focus on your goals and set your business plans for the future. The B stands for ‘beneficial’ and the idea of setting goals that benefit you should be at the heart of all your business planning. When you work for yourself it’s easy to feel bombarded from all angles by articles, business coaches and self-help books who are all telling you what you ‘should’ be doing to build your business. Of course you are eager to get things right and you want your business to do well, but it’s important not to get bogged down with other people’s goals – that’s why you started up on your own in the first place! We know that if you set realistic goals that have a benefit for you, your business and your family, you are far more likely to feel passionate about working towards them, and indeed you will find the whole process more enjoyable. You’ll also feel a fantastic sense of achievement when you reach them. However if you are setting particular goals because you feel that they are expected of you or you think it is what a self-employed person should do then you’re probably going to find them a bit of a chore. So take the time to think about why you set up on your own and what you wanted to achieve. What kind of lifestyle did you want? What did you want to be able to do, have and buy? How much time did you want to spend working? Did you want to help particular groups of people, or get certain results for them? Would you like to be offering a different set of services? Make sure your business goals can all be related to the benefit towards you, your lifestyle or your family. Generic goals like more income, more clients, and more staff are all great for your business but they will each have their own impacts on your life. Have a think about what these outcomes will actually mean. We know that you want a successful business but it pays to think about your definition of success and how this fits in with your business goals. You’ll probably want to earn more money (don’t we all!) but this can be a rather vague and unspecific goal. Instead think about what you want to earn the money for and how much you’ll need to achieve it. So rather than writing a goal to increase your earnings be specific and have a goal such as “I want to earn enough this year to take the whole family to Disneyland” or “I want to be able to finally buy that designer handbag I’ve been longing for!”. Then when you’re working you can imagine what you’re going to use the money for. You could even stick up some pictures on your desk of how you are going to spend your money – and take a look at them when you need some extra motivation! When setting your goals it’s a wise move to consider whether there are any negatives which will actually end up outweighing the benefits of your goal. For example you may feel that a goal should be taking on more staff – but wait, will this actually benefit you? It could bring in more money and help your business grow but it could also mean higher costs ie: having to rent office space rather than working from home and the added stress of having to manage people and cover their holidays and deal with any issues they may have– maybe it doesn’t sound so attractive now! Only you will know what works for your business and every single business owner is unique, but make sure that you write a list of pros and cons for each decision so that you can set your goals prudently, knowing they will really be the best for your business, your clients and you! For the majority of our clients the driving factor in becoming self-employed or starting their own business were personal reasons such as a better work-life balance, spending more time with the kids and being in charge of your own time. Don’t forget about this when you set your business goals and make sure that they will offer you the benefit of the lifestyle you want. For example you might have a goal of streamlining your administration but instead of picturing this as simply getting to grips with your filing, see it instead as offering you the benefit of more time. This could mean having a guilt free lunch with a friend or even being able to go on a date with your partner, instead of being too busy sorting out your paperwork! Make sure that each goal will be a step towards improving your lifestyle and you’ll soon be racing to achieve them! 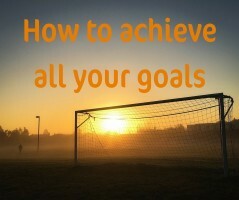 Don’t forget to actually write all these goals down, set them out following the B-SMART acronym: Benefit, Specific, Measureable, Attainable, Realistic, Timely. Look at them often, stick them up where you can see them, make them into a vision board or have them on sticky notes on the walls of your office. Review them! How do you know if you’ve hit your targets without checking? Set a regular appointment in your schedule to review your business plans and goals, perhaps monthly or quarterly. Don’t be afraid to tweak or change them if they are not working for you. Want to see how I do it? I mentioned in the previous blog that earning a certain amount of money per quarter meant that I could take my family on nice holidays. Focussing on that end result, the benefit, helps to keep me on track and motivated to achieve those financial goals. Hitting my target amount of client bookings per month means I can have the rest of the time off, having lunch with friends, visiting family, and being with my children. Devising an online program for my services has the benefit of being able to work with more people, and increase revenue, without increasing the amount of time I spend working. Increasing number of followers/likers on my social media pages means I am building a ‘tribe’ of engaged mums in business who will like and share my content, spread the word about my services and hopefully result in more clients. Hopefully you can see how adding the benefit to the goals, makes it so much more attractive! You can see in real terms exactly what you can do or have if you hit that goal, and it’s something that means something to you. It’s still the result of more money, more clients and more time off, but set out with a specific and attractive benefit to your life. That should keep you on track why would you not want to achieve those things! When a goal benefits you then you’ll be motivated and inspired to achieve it! Create your goals holistically so that they benefit not only your business but also your lifestyle as a whole, and so that they make your business work for you. Follow us on Facebook and Twitter for more tips, advice and support for women in business.